The idea of a veiled architecture of layered surfaces and volumes has preoccupied Erik L’Heureux – a Singapore-based American architect and academic (at the National University of Singapore) – for at least the last six years. 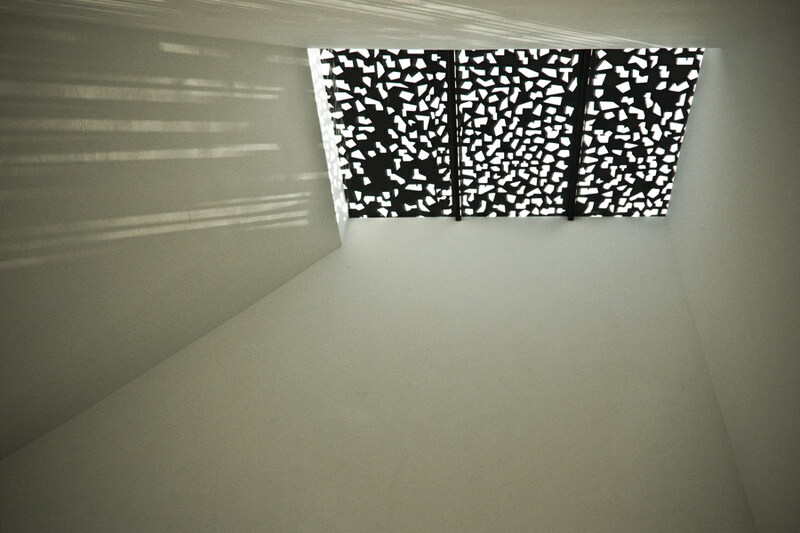 Initially spurred by the need to calibrate his buildings to the heat and glare of the tropical environment and the subtlety with which its atmospheric conditions can change, L’Heureux – through his studio Pencil Office – has embarked on what he calls a ‘resurrection’ of the architectural envelope as a performative element. L’Heureux’s veils are more than facade strategies, however, and have implications well beyond matters related to climate. His completed architectural and interior projects have explored ‘deep veils’ as spatial and material entities of atmospheric and optical modulation, as well as symbolic intensity. Obfuscation via the deep veil is for L’Heureux a means of intensifying our relationships with architecture, nature, atmosphere and each other. 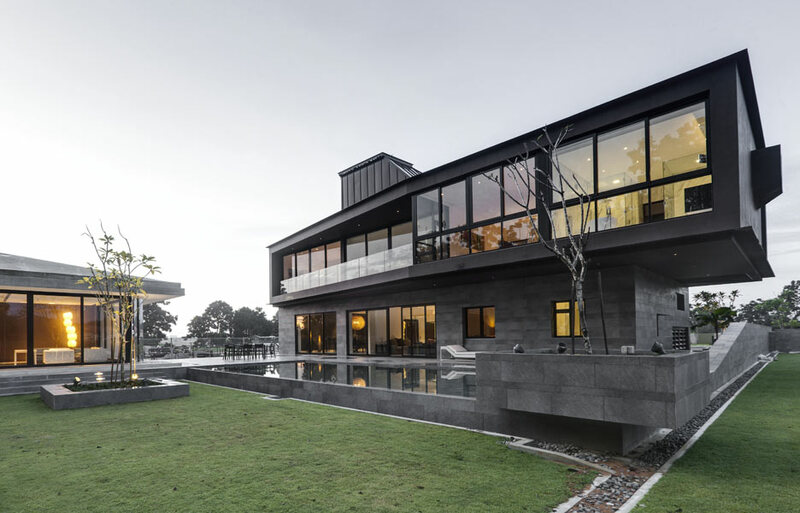 The opportunity to design a neighbourhood of 26 luxury houses in the southern Malaysian city of Johor Bahru (which is connected to Singapore by a causeway) allowed L’Heureux to investigate the functioning of veils and envelopes at the scale of the singular dwelling and the neighbourhood. Beyond an extension of his own thesis of practice, his conceptual approach became a strategy for addressing some of the shortcomings of the generic mode of luxury residential property development in Southeast Asia – namely internalisation, non-interactive streets and blatant disharmony of architectural form in the neighbourhood. It also allowed him to emphasise the value of ‘the view’ and the act of looking. The site, located in the northern outskirts of the city, is a stretch of land with a single spine of road terminating in a cul-de-sac. It is surrounded on both sides by the grounds of a golf course. The site was previously partially developed for housing, with a pile grid laid in 1995 and six bungalows constructed. 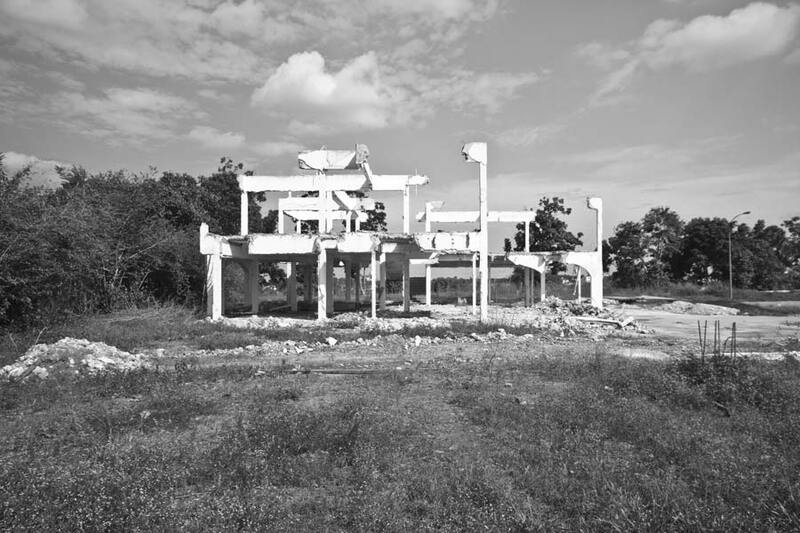 The Asian financial crisis of 1997 saw the site abandoned and the completed houses subsequently fell into dereliction over the next 13 years. The field of piles remained as a relic of another time, highlighting the tumultuous commercial forces that can dominate developments of this kind. With the site secured by another developer, the vision of the pre-crisis era was rekindled in 2010 – albeit with the desire for a new housing typology. L’Heureux was tasked with reshaping the neighbourhood upon the old foundations in order to conserve existing resources. Puzzle-like planning challenges necessarily ensued and he devised six different house sizes and configurations (‘L’, ‘U’, ‘O’, ‘bar’, ‘box’ and ‘block’) based on the pile locations. Three generations (and up to 12 people) can be accommodated in each dwelling. To date one house has been completed and four are currently under construction. 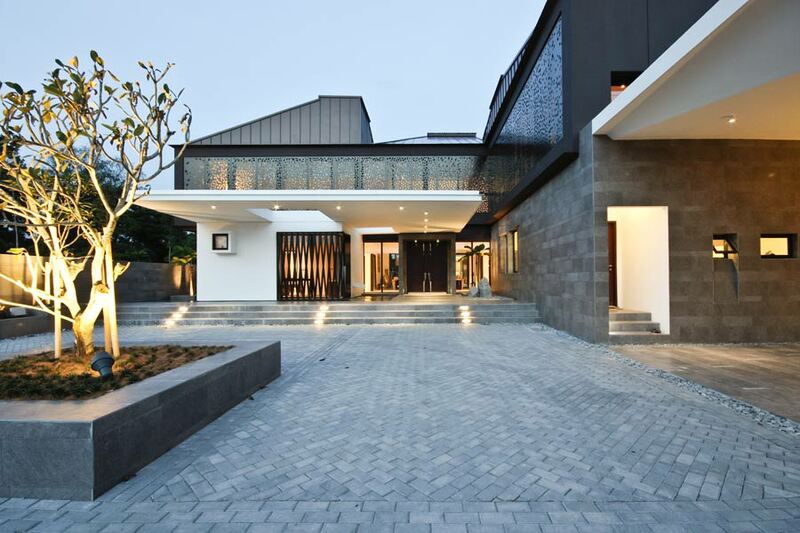 Security of property and safety are commonly cited concerns in Johor Bahru (perceptions that are probably inflated to some degree by way of comparison to Singapore). L’Heureux’s approach to ‘masterplanning’ the gated neighbourhood resisted the typical bunkering effect of complete privatisation of space beyond the street. He narrowed the previously wide road, set property boundaries back from it and established a green zone that encourages a communal pedestrian experience of the neighbourhood for residents. 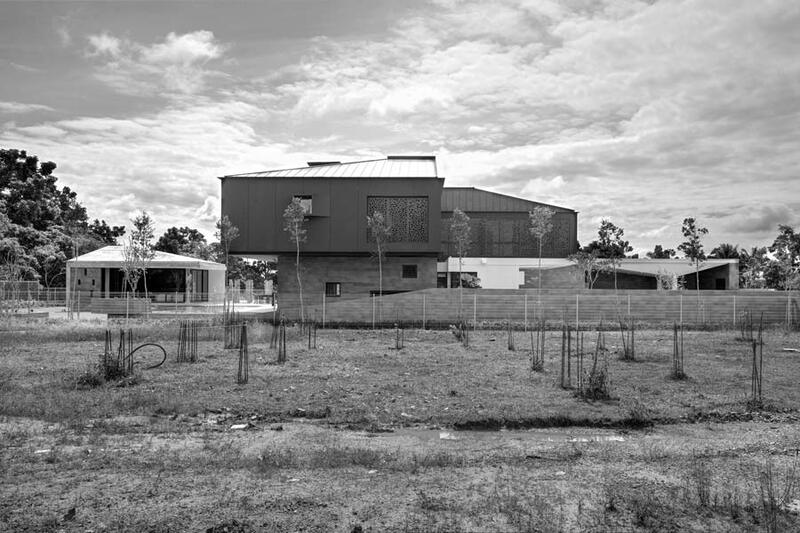 The houses were conceived as individual and aggregate entities, with each flanked by a large drive-in courtyard. In the constructed dwelling, the boundary wall merges with the car porch enclosure and addresses the developer’s desire to create visible evidence of security. Angled apertures with grilles introduce the notion of directional viewing, as well as revealing and concealing the spaces within. The pile grid drove a planning arrangement of three bands that run from the front to the rear of the house. Both ends of the house can be opened up for thorough ventilation. 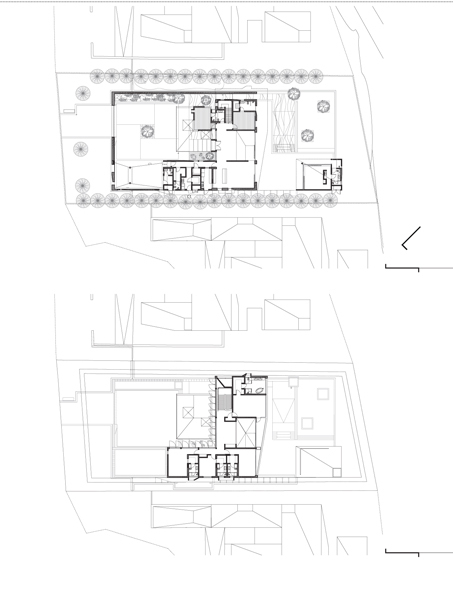 The mass of the house is broken into blocks, with ‘floating’ second storeys displaced in plan to generate overhangs. The roof volume, too, is aggregate in form, with three angular protrusions expanding the interior volumes upwards while also admitting filtered natural light and functioning as thermal chimneys. Material use and treatment – raw and tiled concrete on the first level, paint with iron oxide pigmentation on the second level and similarly painted roof sheeting – will be repeated across the development, such that a cohesive and collective neighbourhood identity of non-singular house forms is established. Small staggered openings in the primarily opaque side elevations direct vision toward views rather than the neighbours. Operable-patterned, perforated aluminium screens facing the street offer a shading function, while also controlling vision into and out of the house, which L’Heureux describes as an ‘optical machine’. The degree of perforation was varied to enhance access to views and shield areas requiring privacy. This more opaque veil to the street is countered by a more open relationship with the golf course, ridges and distant palm oil plantations to the rear. On this side of the house, the architectural envelope is deeper and more dynamic, with overhangs and balconies creating a habitable edge – a culmination of the veiling process that began at the courtyard wall.